Coming home from work, I saw a yellow “CLOSED” sign on Monty Q’s door. Makes me sad, having had a nice yet very affordable pasta/pizza meal there last Friday night. Not gourmet, just fast and tasty. I know there have been some DOH issues in the past — any idea what’s up? 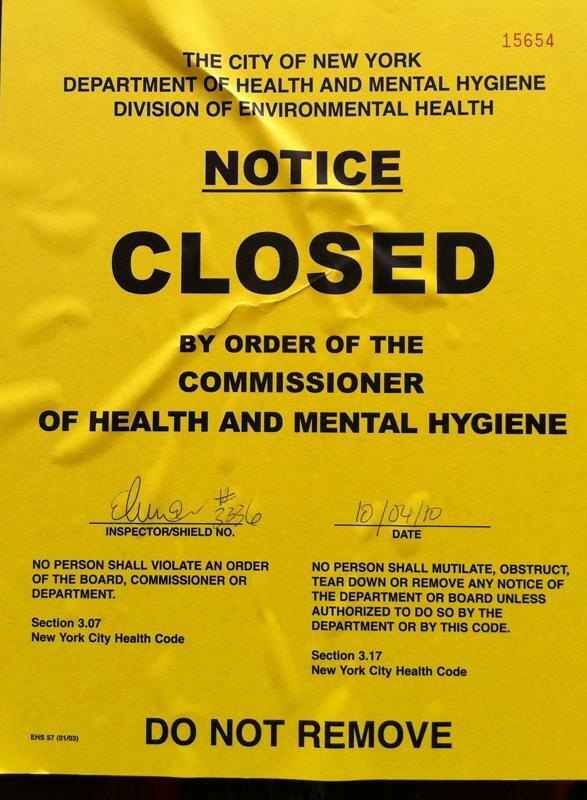 Update: As confirmed by our BHB tipster and by the DOH website (finally updated today), Monty Q’s has racked up 50 NYC Department of Health violation points. We’ve said it before and we’ve said it again – the DOH is very aggressive with their inspections and a high number of violation points doesn’t mean death for an eatery. Update 2: BHB’s Heather Quinlan reports that according to the restaurant, they’ll be reopening in “two days”. Anybody know anything about Fatoosh? Tried Reginella last night and delivery was quick, pizza was hot and pretty good… I recommend it. My friend received food poisoning from MontyQ’s, that place is terrible. I’m glad I’ve read this and now know to also avoid Lassen & Hennings!